In my last look back at Judges Guild’s 1977 City State of the Invincible Overlord, I avoided mentioning the product’s oddest quirk: Every non-player character has an adventuring class and almost anyone worthy of a name has 4 or more levels, mid-level for the era. Did everyone in the city begin as an adventurer, and only later settle down to become a candlestick maker? All the fighting men and magic users seem weird now, but in 1977, they revealed potential answers to two questions no one asks anymore. So I wondered what I would do if the players upended the game by targeting the townsfolk. The player characters’ combat abilities overwhelmed the 0-level citizens and their 1d4 hit points—a single blow from a house cat would slay many of them. I could launch human wave attacks on the players, but I had no stomach for such imaginary slaughter, and the PCs would still win. I would need to summon high-level do-gooders from afar to pit against the players, now in the role of super villains. The game would degenerate into a total-party kill or a succession of escalating face offs. Thankfully, my players honored the game’s social contract and stuck to the dungeon. Still, the question and my lack of an answer unnerved me. As D&D adventures expanded beyond the dungeon, DMs everywhere faced the problem of how to counter players who saw towns as easier targets than dungeons. The City State of the Invincible Overlord reached players in 1977, years before T1 or B2. Authors Bob Bledsaw and Bill Owen faced more potential for murderous looting than Gary. Most players who sit to play an adventure will follow the plot threads, but the City State offers a sandbox, which gives players free reign. Why bother leaving town for gold and the experience points that it brings? While the city doesn’t encourage adventurers going from store to store, murdering the proprietors for their cashboxes, it allows for it. Every location includes an account of coins and other treasure, usually hidden, often trapped. The treasure stashes in town match the loot available from the dungeon. So what stops players from treating the city as a sprawling gold and experience farm? First, the City State features an even more robust legal system than the Keep on the Borderlands. The initial guidelines devote with two pages to crime, trial, and punishment. With enough bribes, a murderer might escape execution, but the price in treasure offsets any gains. Even an ordinary foot patrol consists of 2-24 level-3 guards and the Overlord can call knights and wizards to challenge greater dangers. In case of loan default, open box. Second, some citizens posed greater threats than they appeared. As I mentioned in my last post, any shopkeeper could be a polymorphed Ogre Mage or Dragon. 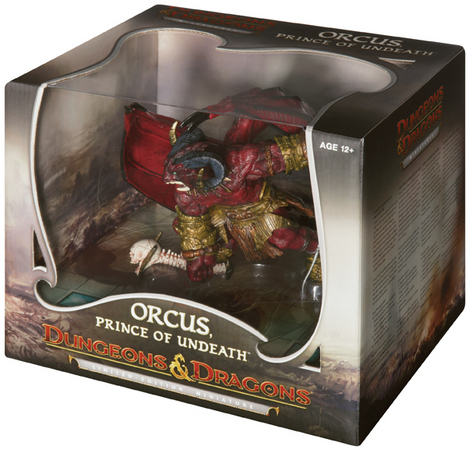 Worse, a loan shark might have a way to counter thieves and scofflaws with Orcus the Demon Prince. Last, the NPCs create a balance of power. In the City State, every inhabitant gets combat stats, and the local baker could be a badass—actually he probably is. For example, the silver smith is a level-6 fighter aided by the (fighter 4) tinsmith next door. Even the lowly (fighter 5) tanner pays a troll to guard the cashbox. Although the City State’s population seems dangerous, in the Judges Guild world, it ranks as a lower-level city. Its follow up, City State of the World Emperor, warns that its NPCs tend to be a level or two higher. All those fighters and mages in the City State reveal a possible answer to another question no one asks anymore. In a D&D world, what character class do ordinary people belong to? Stuck at level 0. Even with experience, ordinary folk never rise to distinguish themselves. Gary Gygax adopted this approach for Advanced Dungeons & Dragons and it carries to fifth edition. D&D casts player characters as special—extraordinary individuals capable of gaining levels and rivaling heroes of legend. Advantage: Players feel heroic and powerful. Because few rival their potential, they take center stage in the game world. Disadvantage: Power corrupts. Players feel tempted to behave without a realistic sense of the consequences their actions. A level-20 tailor creates the world’s finest trousers. Everyone has a class that advances as their skills improve. These non-adventuring classes gain experience differently than adventurers. Dave Arneson experimented with this approach when he created the Sage class, adulterated in the Blackmoor supplement. Such specialized classes peaked with third edition’s Expert and other NPC classes. Advantage: Both NPCs and PCs in the game world operate according to the same rules, creating a mechanical consistency. I’m a level-3 blogger and a level-2 dungeon master. If I collected g.p. for this, perhaps I would gain XP faster. Disadvantage: Character classes weigh NPCs with rules, calculations, and bookkeeping that rarely makes the game more fun. Curiosity: In third edition, a high-level, expert tailor gained hit points and became harder to kill, suggesting that some hit points come from plot armor. If you only have Fighting Men, everyone looks like a fighting man. Ordinary folk take the same few classes as shown in the game’s little brown books. The authors of the City State adopted this approach. Advantage: Everyone poses a potential challenge to PCs, forcing them to behave with a realistic caution. This prudence reflects the reality that even the most dangerous warrior can be overwhelmed by a mob or slain by an arrow in the back. Disadvantage: Making everyone a match for PCs seems implausible. If player characters must complete long and dangerous adventures to become mid-level fighters and magic users, then how did everyone in town gain similar levels? A city full of such dangerous dyers and wheelwrights defies the game’s logic. Also, powerful NPCs can diminish the role of the player characters. If everyone has power comparable to the player characters, then what makes the PCs the heroes of the game world? The potter and the carter can just grab a few buddies and slay the dragon themselves. Some of the joy of role playing comes from the chance to feel powerful, to seize the spotlight. People play D&D to act without the compromise and frustration of the real world. Making everyone an adventurer makes the PCs common. In the era of the City State, players could feel common without diminishing play. PCs did not need to be central to the game’s story, because any story was purely accidental. Players chased gold and the experience it brought, end of story. Then, powerful NPCs either served as bystanders or obstacles. As D&D became less about chasing treasure and more about thwarting evil, NPCs changed from potential sources of loot into folk to protect from the closing darkness. This entry was posted in Role-playing game history and tagged B2 Keep on the Borderlands, Bill Owen, Blackmoor, Bob Bledsaw, City State of the Invincible Overlord, Dave Arneson, Gary Gygax, non-player characters, sandbox, T1 The Village of Hommlet. Bookmark the permalink. I recall this issue came up at the very beginning of 4E, because PCs changed so dramatically from relatively weak entities (a rat could kill you with a lucky hit) to very strong super-heroic entities. For example, how does a town deal with an eladrin thief, who could teleport through the bars… at level 1? Did every town suddenly build windowless jails? This was actually asked at an early 4E convention of some of the designers. The answer was along the lines that the game just wasn’t trying to simulate reality the way 3E did. I think that’s a fair answer, honestly. It falls on the DM to tell that narrative, rather than the rules system. Organized Play has long dealt with “murdering” PCs, because the format puts so many different players together and some can choose not to honor the social contract. In the 3E Living Greyhawk campaign we had a player cause the favorite tavern to be destroyed by demonic forces. In the 4E Dark Sun campaign we had a convention where a player used defiling magic… but is supposed to be a member of the never defiling Veiled Alliance. Examples are countless. There used to be very heavy rules of conduct, promising suspensions for those that caused problems. The reality was that they weren’t used because it was easier and better to handle things with guidance and DM teaching. A long-standing rule is a cap on treasure or to specifically state what treasure “exists”. The 5E rule that monster weapons and armor are somehow useless the moment a PC wants to sell them… that is a necessary suspension of disbelief to prevent players from stripping every bit of loot from foes and selling it. Every campaign has had to deal with this. In most cases, even new players shrug and go on with little impact. The more savvy (or devious) realize why these rules exist and how vital they are to keeping play focused on the best experience for the group. Wow, great stuff. Thanks for commenting. I’ve been a player and a DM for a lot of years, but I cannot match the stories from someone involved in so much organized play. I suppose eladrin jails are windowless, and in most human-dominated places, no one builds jails for something as uncommon as an eladrin and as rare as an eladrin thief. Need be, the jailors lock anyone with pointy ears in the cellar. As you know, 4E’s steep power eventually forced scaling to counter the players. For an earlier post, I checked the stats for a town guard in a heroic-tier Living Forgotten Realms adventure. As scaled for party level 10, this rank-and-file guard has AC 26 and 106 hit points. Where were these super guards a few adventures ago when the goblins attacked the town? Those goblins could only hit AC26 on a 20, so they would have needed to make an average of 262 attacks on each guard to earn a kill. And the 4E town guards are an issue that really seemed to bother WotC. If you are in a level 1 adventure, the town guards are level 1. If you are level 10, the town somehow has level 10 guards. Same with the bandits. Personally, I liked that. It makes sense that the stories worth telling are those where we went to a village worth remembering, and faced allies and foes matching our world. Plus, at level 10 the DM should really focus on what matters (the town guards probably aren’t even worth thinking about, let alone creating stat blocks for, and the threats should be more interesting than ‘bandits’). But, that really irked many (the excellent Chris Sims talked about it on Twitter) and seems to have resulted in the 5E vision where the world is supposed to be one way and the progression is more tame. The guards are easy, but could increase in number to be a more credible threat. The locks on doors are just one DC, but the scaling is slower and it takes an exceptional PC to make the check completely trivial. It’s okay, but for my narrative I like the first model, as artificial as it may be. I wanted to separately bring up that this murder/thieving behavior isn’t the domain of the power gamer or abussive player. There are countless tales about completely new players who engage in a murderous rampage from the very beginning. Some of my favorite stories involve parents playing for the first time! It seems to be something about the fantasy element and how quickly some players realize this isn’t real life and want to test the limits. Why be responsible in a fantasy world? Why deal with behaving and social convention if the point is to enjoy the fantasy? It isn’t how I approach the game, but I can see that. I can also see how the rules are a sore way of addressing the issue. I treasure my copy of B2, because it contains the truth of how weak a DM I was. Scribbled in pencil are notes from the 7th grade, detailing all the murders and robberies the party committed, and the sad countermeasures I tried to create. It remains a lesson to me today. The answer wasn’t “more guards” or a devious trap. I see the same mistake made these days, where a trap or foe is seen as impossible to defeat… but the designer provides a stat block or DC for it. Never provide statistics for something that should not be defeated! Instead, educate and use the narrative to bring players back to what will be mutually fun. In the D&D Encounters program, I introduce ton of young players to D&D. I tend to see an evolution from excitement that they can attempt anything, to a discovery of the value of behaving so everyone has fun. A bunch of kids have graduated from my table to their own, with a peer running a campaign. I’m so proud. The biggest conflict that I see comes from reckless instigators rather than from experiments with chaotic-evil. One kid says “I open all the doors” over protests from folks who favor more thoughtful and cautious play. In 4E, the instigators prevailed because everyone realized that they never faced an encounter they couldn’t beat. In 5E, players discover they can get in over their heads. Now the instigators get tackled before they go too far. I think every DM has seen some impossible-to-defeat trap or foe defeated, and seen their assumed story arc in ruins. I hate when that happens (and love it too). Wow, you’ve hit upon one of the things which I feel is THE major flaw in D&D. It is why I steered clear of D&D(but not RPGs, or STGs, or SGGs-story generating game) in the 1970’s and why I left again after taking D&D back up when 4e came out. The flaw is this: Even though it is a fantasy game, the one reality that should remain is that player characters are NOT all powerful. This hero and his friends were caught in the University town, when another one of the Duke’s nephews had ridden in to take control of the University(i.e. magic school too), because the University had published a paper explaining that the “rebel” faction in the civil war actual had the Law in their favor. The party escaped the University to warn the Duke of his other nephews action. Now some minor knight would never be admitted to see the Duke, if he had not already meet the Duke and had some standing. For his action in saving the University, he is given 2nd in command of a keep overrun by the Orcs. He is asked to take on another mission for the Duke and is given a 3 month leave of his post. When he returns, the man given control of the keep, though a fine fighter and loyal, has been a terrible administrator, and a change is needed. The hero is given the control of the keep, and the former head becomes his second. The Duke dies and his son replaces the hero with surviving members of the family which originally held the keep. He is given the job of “spying” on the empire to the south of the kingdom. As his kingdom is somewhat weaken because the Duke, before he died, had sided with the rebels(largely because his nephews had invaded the university) and forced his nephew to turn over the throne to the other contender. He discovers one of the leaders in the empire is planning to invade his kingdom and thwarts those efforts. Upon his return he is given a position in the new government. At one point he arrives in a town where the sheriff has been murdered, and because of his position in the new government is the highest ranking member of the constabulary portion of the new government in town. He catches an evil warlock, who has been masquerading as an earl. 1) At anytime he or the party alone could have been easily overwhelmed by the army, town, university, etc. It was only by working within the “realistic” framework was he and the party able to succeed. And though the party was not all powerful, they were heroes. 2) There is no need for a explicit social contract. The explicit social contract can hamper contention within the PC party. This contentions needs to be there. The mages who had other objects weren’t thrilled about some aspects of what they had to do. 3) Do you see any mention of level or experience points? I hope not. Is there any doubt that the PC was gaining social status? 4) Its obvious to me you are playing D&D the “right” way. But when there is such an easy way to fix D&D without extra rules or social contracts, why is the game still suffering through these issues after 35-40 years? Because catering to egos sells. It has nothing to do with realistic verses fantasy, it just commercialism. You can have fantasy with good story without the negative potential, but it doesn’t sell nearly as well. Well, I feel as though powerful characters have their place. Some of us LIKE having a story where the main characters are easily able to take on, if not armies, at least dozens of enemies and emerge victorious. For example, in 3.5 and Pathfinder, a tenth level wizard could effect entire battles by his/her presence, and a twentieth level wizard is basically a demigod (hell, in 4th, an epic destiny was literally demigod). I do agree that if that is not the type of story that you enjoy, Dnd is not for you, outside of the very low levels. But there is something fulfilling about the higher “power level” of Dnd for me. For reference, Dnd’s main setting isn’t really medieval, that is, a time when power was concentrated in larger institutions. Wallace Cleaves says it better than I can, “Adventuring groups just aren’t very medieval. Instead, they are – for lack of a better term – “Tolkienian,” and Tolkien wasn’t trying to replicate the medieval world but rather some Ur England of legend.” Placing everything in that context makes much more sense. Hercules or Beowulf were individually very powerful people, and the Belgariad would have been a very different story if it revolved around the main characters carting an army everywhere. On your point #2… I hate party contention. Hate it with a passion. Call me childish, but I enjoy having a party that, for the most part, gets along. Why is it needed? Games like Paranoia and World of Darkness may enjoy doing that sort of thing, but Dnd is set up with the default assumption that the party works together. I like that assumption. When I make a character for a party, I make that my character has a reason to stick with the party, because the reality is that I, the player, won’t let me, the character leave the party even if he really should. So I cut out that whole in/out of character nonsense at the very beginning. As far as #3 is concerned, where do you get that level is something tied to social status? I’ve always DMed them as separate things. A 15th level hermit monk has the social status of a beggar to most people. Also, a lot of your complaints are being alleviated with the new bounded accuracy system. Enough guards will kill you, no matter what level you are. Party contention has ended badly whenever it emerged at my table. I’ve written a couple of posts that concluded that if you want party strife, you should probably play Paranoia. Over the years, D&D has improved at matching the players’ growing power with greater stature, and with greater challenges. Just look at the description of the tiers of play in the fifth edition DMG. Each tier widens the scope of adventure, increases the typical PC’s notoriety (hermit monks aside), and presents more dangerous threats. This widening scope improves on the original game, where PCs just went deeper into the dungeon. Thanks for your commenting. For most players, much of the fun of D&D comes from the chance to grow into someone powerful, free of the constraints and compromise of real life. I think a good D&D game can offer players a taste of that power while providing tough choices, intrigue, and problem solving. You seem to favor a game where players need to rely on their wits and relationships to thrive, where players can never sometimes live by the sword. As you suggest, D&D probably isn’t the best ruleset for that. I’m always struck by the depth of the stories that emerge from your game table. D&D certainly can be a good game. But too many times it is not, and there are too many DMs lacking in judgment. I also find the glossing over of combat a problem. If you are going to simulate a fight, simulate a fight. I have my players live by the sword, not by rolling the die. And now you’ve touch upon the second biggest problem with D&D. I think D&D leads to misperception in younger minds that fighting is easy and casually entered. I would prefer a game that teaches that it is dangerous and deadly, and it must be entered resolutely rather than for ego. Perhaps we had too many D&D’ers in congress in 2001. I’m not against people having fun, but am concerned about the development of irresponsible attitudes. I still contend that the fiscal interests in developing a popular game actually hurts the game. The two in question 1) D&D is set in a Tolkein’ish world and 2) party strife is to be avoided. How can you have the Tolkein’ish story without party strife? Erase Boromir? No council of Elrond? Legolos and Gimli have always been close friends? Parties members should have strife, opinions, and disagreements. The story of how characters overcome these issues and work together is what makes the story. I feel many DMs gloss over the aspect of this game as much as they gloss over the actual details of combat. Both of which diminish the story. Thank goodness D&D 5 has restored some penalties for PCs behaving badly. A reasonable change in the setting description/game mechanics leads to a better story. Failing that, I guess social contracts are the next best thing. Does D&D 5 suggest using these in the game? When I was saying that D&D was set in a Tolkien-esque world, I was referring to the setting where individual adventuring parties could affect the world through sheer martial prowess. But nevertheless, your point is valid, and my friends and I have had this argument many times. I suspect that my aversion to inner-party conflict may be caused by the fact that I can’t get past the faces at the table. That is a role-playing failure on my part. But there are other reasons. One is that, in a book, the characters will eventually “overcome these issues and work together,” as you said. In a role-playing game, here’s the question that should be asked: what if they don’t? What if I decide that, playing my character as his personality dictates, I did as Boromir did and attacked a party member in order to used his cursed artifact? The party would naturally react badly. I would probably be killed, or at least driven away from the group. And at that point, I, the player, could no longer play the game with the others. Knowing this would happen, I, Boromir’s player, wouldn’t betray the party even when, in character, it would have been the logical thing for me to do. Because I want to keep playing the game. And that is the ultimate breakdown in role-playing, when the Character makes decisions based on what the Player wants to do. Now, I could just betray the party, get myself killed, make a stirring death speech, and roll up a new character. Maybe take command of a nearby NPC. I have now lost a character that I’ve probably worked on and nurtured for weeks, and the party’s got to find some excuse to hire that barbarian mercenary in the next town because lord knows they won’t survive without a meat shield. Some conflict may be good. Legolas-and-Gimli style bickering can be found in any group, and will rarely turn violent. Politics should always be complicated, and is mostly outside the scope of the party anyway. But on issues where it really, truly, matters the party should act in accord. It just doesn’t do to have the team arguing about whether they should save the orphans or eat them. A party like that should never have been formed in the first place, in or out of universe. I don’t think it’s as easy to break the synchronicity between player and character motivations as you might think, though. If the warrior leaves or dies then the party, in character, don’t need some contrived story reason to go and hire a mercenary. They need to hire a mercenary for the same reasons as the players: they need a meat-shield. That is the story. I would say that, far from being the ultimate breakdown in roleplaying, if the character is making decisions based on what the player wants to do then that means player and character have the same goals in the first place, which is exactly what you want for roleplaying. However, as it is also a social game and intended to be collaborative, the party as a whole needs to have the same goal before that can really happen, so I broadly agree that in-party strife is a bad thing. And this is why I now prefer to run a story generating game(SGG) rather than an RPG. I expect all the players to contribute to the story, and don’t really know what will happen, neither do they. We all have input. The mechanic is simple. Develop or borrow a world, add a few vague ideas for plot. Use or generate RANDOM made characters and begin to play. So you then begin developing the story. Player can suppose that a certain thing is true or by asking a NPC a question make me suppose something is true. We roll 1D100 (00-99 with low being good). 00 means the best outcome for the PC; 01-04, fantastic outcome, 05-14 good outcome, 15-34 favorable outcome, 35-64 neutral outcome, …, 99 worst outcome. Yes it’s a bit tough to GM a game like this, you have to think on your feet and be creative. But don’t worry your players will help you. Notice how a game like this is about story, not combat. (But if you like melee, you have no need to worry. The only problem is that the combat simulation is fairer in this system.) A player succeeds when he is specific in asking or supposing what his PC is doing. So if a player asks if his PC have musical training and the die roll says no, then they have no musical training. But if a player asks if his PC plays the drum, and the answer is no, he may still excel at another instrument, or singing, or composition. When PC asks a NPC a question, I or the player first roll to see if the NPC has an interest in the question or the outcome of the question. And based on that roll, I can have the NPC offer to help, or decide he has a reason to work against the party’s interest, or roll again to determine if the NPC happens to have seen something and recalls it. Perhaps if the PC would give a better description of what the party seeks, it might cause the NPC to remember something. Sometimes the NPC is already part of the plot, and the player is rolling to see if they recognize the deception the NPC is employing. So what you end up is an open-ended story that the group has generated. Again the combat is more detailed than D&D, so I run about 4-5 sessions of story until a good fight breaks out. Then I run the fight in a session all it’s own. So besides the 1D100, we also roll 2D10 trait saves (i.e. like the original D&D saves, before DC checks) and hit locations (2D6 where 2 is head,… 12 is foot) in combat. Everyone has a hit percentage, which is modified by tactic of the attacker (swinging, stabbing, etc.) and defender (dodging, parrying, etc.) Players have cards which they place face down for their tactics, I announce the NPC”s attack and then they reveal their tactic. You’d be amazed how hit location influences the resulting story. Stories are about details. D&D is first about characters. You said so yourself. And often that is good. Unfortunately characters can be fronts for player egos, and not really characters. When players are using PC’s as ego substitutes character death, party acrimony, and min-maxing are all BIG problems in the game. But also why D&D sells. There is a selection process in the game for players who will have bad behaviors, and DM’s always have to vigilant. But I’m not buying, I have better things to do with my time, including playing SGGs. What system are you using? Or is this a system your group generated? I’d like to read up some on these mechanics. My group is always up for trying out something different (We recently played a couple sessions of the Dresden Files RPG, and last month we played Champions), with the sole exception of Paranoia. Our mainstay is still D&D, though we skipped over most of Fourth Edition in lieu of Pathfinder. My experience of highly narrative-focused systems is that we spend lots of time deciding what “should” happen next instead of using gameplay to determine what does happen next. I dislike any system that urges players to “do what is best for the story”, because if I want to write a story myself, with or without the help of friends, then that’s what I’ll do. For me, the main pleasure of RPGs is in watching the story emerge from the gameplay without me having to worry about it. This is why I like to have a definite gameplay goal like “kill the necromancer” or “save the city”, or even “kill monsters and amass treasure”, so that my gameplay goal and my character’s in-universe goal align and I can get on with playing the game. Then when it’s over I can look back on it and realise there’s a story there. From your description of the system you use, it sounds like it involves a lot more random generation of details, which I guess would mean less deliberation over what’s best for the story, but doesn’t it also lead to rather stilted, improbable things? Great Site!! And awesome article. I have proposed this very thing in a game recently where I was a player and I thought the DM was making the encounters a little too hard for 1st level characters. As long as the PCs are fighting “bad guys”, looting dungeons and thwarting the plans of the latest mega-villain, everybody is having fun and coming back next week. The fact of the matter is, if you have PCs interested in doing that… maybe you need to improve your game as a DM and give them something more fun to do… if they are bent on a murderous run… then maybe they are not what you want at your table. Thanks for some good points. Your comment about town guards with unlimited hit points reminds me of playing Ultima back around 1981. You could steal from the town merchants, but if you got caught, you had to run because the guards were indestructible. They were the most dangerous foe in the game.